Hudson County is ready for the upcoming election on November 10 with new technological improvements for residents in the county. 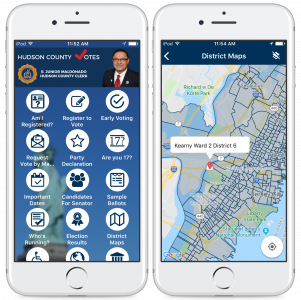 Most notable is Hudson County’s updated mobile app by county clerk E. Junior Maldonado. The app is available for free on both iOS and Android. – Allow citizens to register to vote. – Provide info on early voting. – Allow people to request a vote by mail. – Obtain info on party declaration. – Access a calendar of important dates. – View a list of candidates for senator. – View samples of completed ballots. – Receive more info on who’s running in the election. – View election results from the past. – Access a district map to see what district citizens are voting in. – Find locations on where to vote. “We believe that our investment will pay dividends for years to come by allowing the public an easier, more secure and transparent way of obtaining necessary and critical information.” said Hudson County Clerk, E. Junior Maldonado. Hudson County staff plan to keep residents up to date as election day progresses with push notifications. Citizens can continue with their day as they received election notifications, keeping them engaged. With the mobile app, citizens don’t have to refresh a web browser or a social media page to stay informed; they can just use the app. The Hudson County election app was built using 14 Oranges’ Info Grove platform. Info Grove is equipped with a cloud-hosted content management system and allows county staff to independently update and add content to the mobile app. Click here to learn more about Info Grove mobile apps. 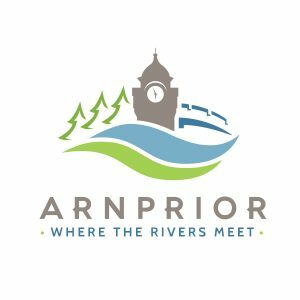 The Town of Arnprior, Ontario, with approximately 8,795 residents, has launched a mobile app to improve communication and engagement with citizens. 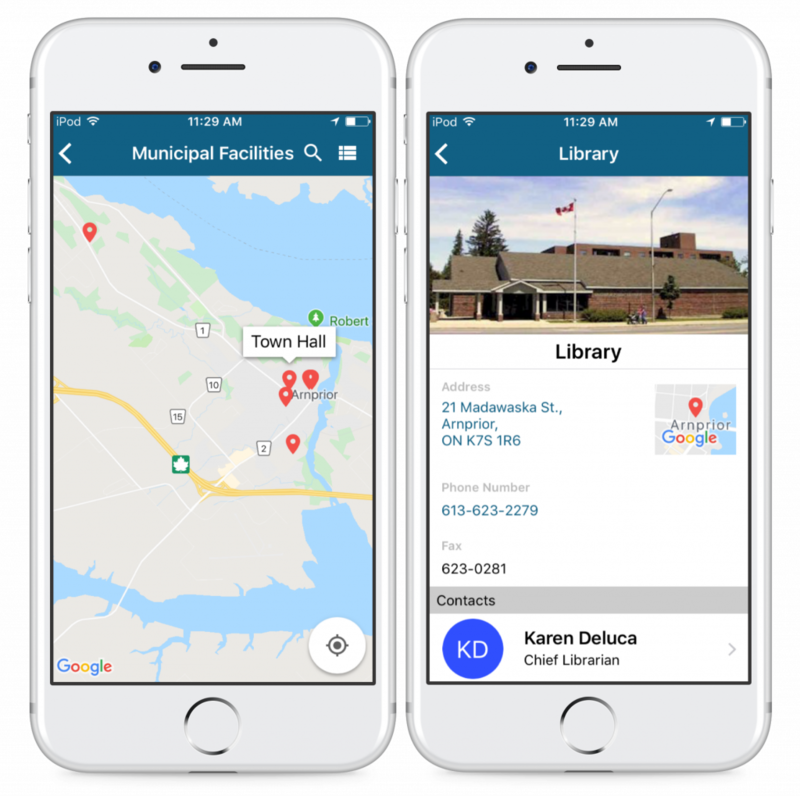 Available for free on both iOS and Android, Arnprior residents are now equipped with an on-the-go mobile application to perform daily tasks and navigate within the town. 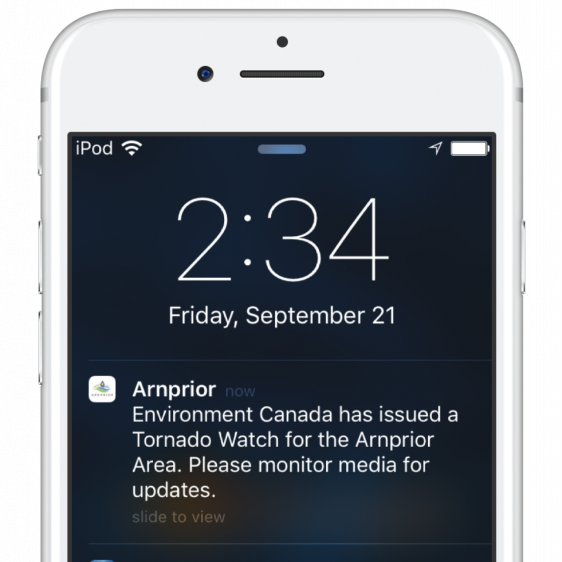 The Town of Arnprior focused heavily on location-based engagement by providing automated notifications with “beacons” to notify residents. Residents will be notified when driving by the Arnprior & District Museum about the latest exhibits, for example. Or, while biking along Robert Simpson Park a message will encourage the user to learn about the upcoming concert in the park. These are just a few of the geographic-based notifications provided by the Town of Arnprior. 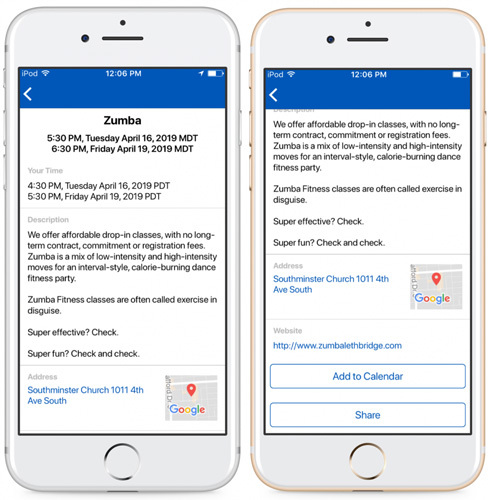 The app also encourages active mobility in the Town by including locations lists and information for healthcare facilities, parks, libraries, trails, parking lots, and municipal buildings. 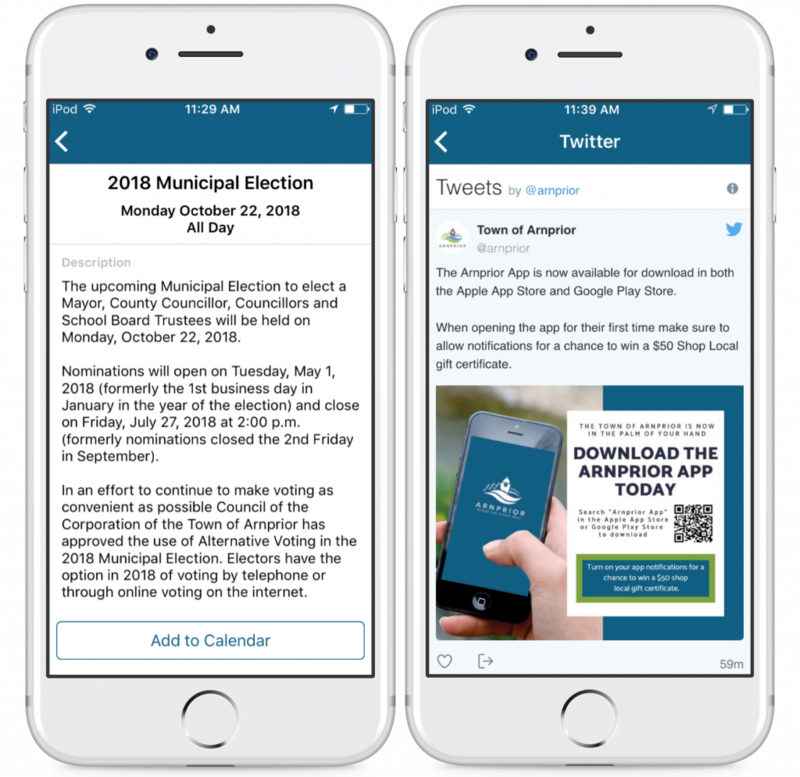 Town staff plan to constantly update and add new content, such as the “Vote 2018” features that help citizens participate in its upcoming municipal election. Residents can view the schedule of events, register to vote, view registered candidates and view FAQs. 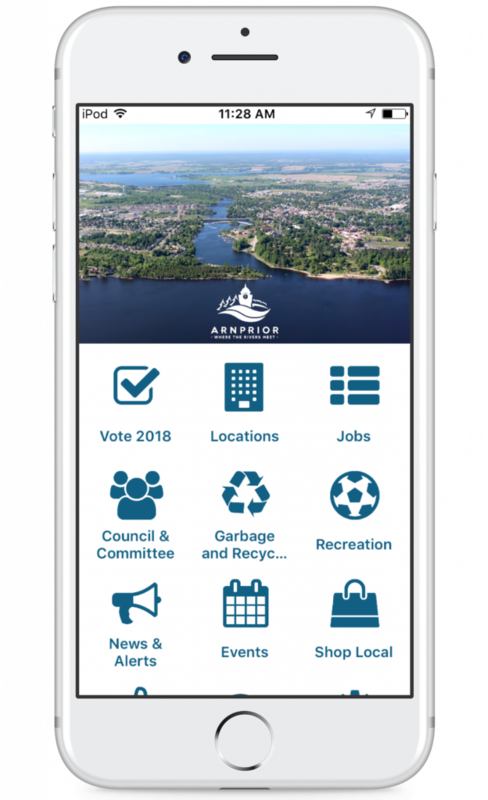 After the election commences, Arnprior staff can access the Info Grove backend, delete the election content, and add new features to keep the app fresh. 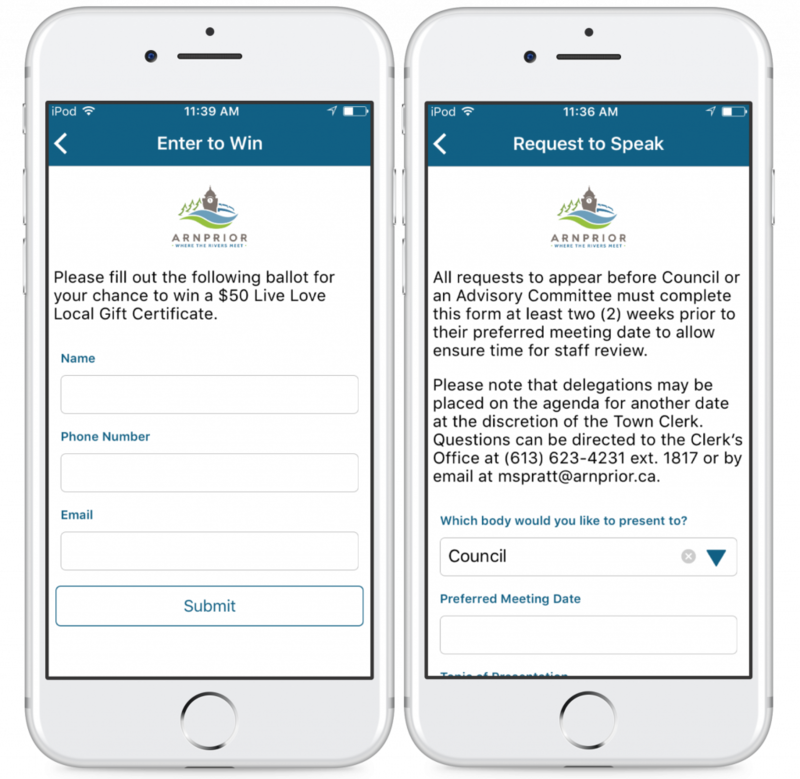 In order to facilitate two-way communication, the Town has added important information about council and committees, such as meeting calendars, the mayor and council list, agendas and meeting minutes, and a “request to speak” feature. An important focus of the app was to help citizens complete real-world tasks. Citizens can access garbage and recycling schedules and view recreation schedules like public swimming or ice skating. Lastly, citizens can view information on job opportunities, access festival and event details, and information on road closures and other emergency information. “It is the wave of the future,” Mayor David Reid said about the Town’s new mobile app. The Arnprior mobile app was built and hosted using 14 Oranges’ Info Grove platform. Click here to learn more about Info Grove mobile apps! 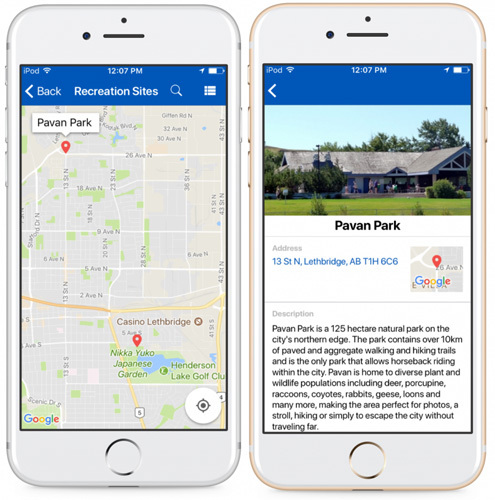 The City of Lethbridge has released its new mobile app for citizens and visitors to explore parks and recreation within the city. 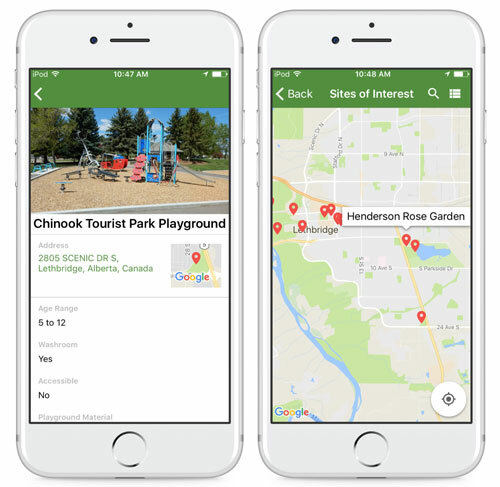 The Lethbridge Parks app is where users will find information on parks, playgrounds, pathways and other outdoor activities in the city. Available for free on both iOS and Android, the new mobile app demonstrates a mobile-first approach to active engagement within the City of Lethbridge. The mobile app allows users to access a wide variety of city information in a convenient mobile format. The majority of content is available offline, meaning users do not need a data or a wifi connection in order to access information. 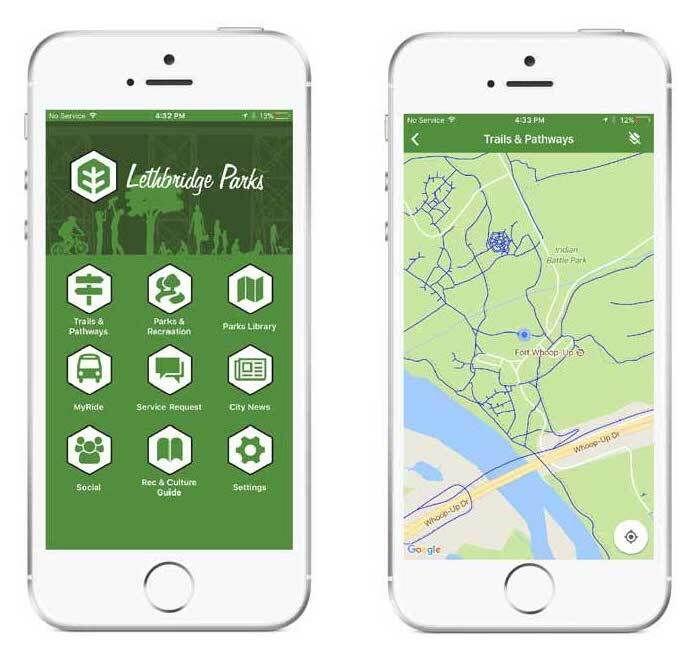 Lethbridge Parks strongly encourages active engagement with city facilities and public spaces, and the new app will make it easier for citizens who aren’t aware of the opportunities to get engaged. According to the City website, Lethbridge Parks offer many benefits to residents – they connect citizens to the city’s past, help to keep citizens healthy, make them happy and are good for the environment. Synced with Google Maps, users can avoid the busy streets and opt to travel via the cities large network of trails and pathways. 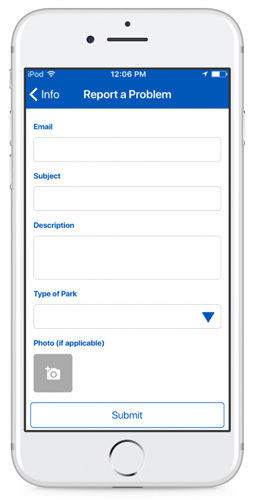 The app provides a list of all parks, green spaces, playgrounds, sports fields, recreation sites, and sites of interest. Users can view the list alphabetically, sort by distance, or search by keyword. Also, users can switch from a list to a map to provide a spatial perspective. Once a user finds a place of interest, they can click on it and learn more about the space. For example, citizens can learn whether or not a playground has a public washroom, if it’s wheelchair accessible, and learn about the playground material and surface. If citizens want to visit the space, they can quickly get directions via Google Maps. Or, they can click on the myRIDE feature, which provides a directory of modes of public transportation in the City of Lethbridge. To help facilitate two-way communication, the mobile app allows citizens to report a service request in and around the city. Citizens can report problems such as graffiti, potholes, or broken equipment. The app connects users to city news, via an automatically synced RSS feed. The City of Lethbridge recreation and culture guide is a monthly publication that promotes activities, programs, and services for the citizens of Lethbridge. Through the app, citizens have access to the PDF documents to review. The app allows citizens to access all City of Lethbridge social media accounts, including Facebook, Twitter, Instagram, and Youtube. The City of Lethbridge mobile app was built using 14 Oranges’ Info Grove platform. Info Grove is a combination of a mobile app and a cloud-hosted content management system. Info Grove allows City staff with no technical background to make edits within the app and add new content with ease. Staff can create new buttons and content for temporary events, update resources, and adapt to the opinions of the citizens. The City of Lethbridge will be able to send push notifications to update citizens regarding emergencies or facility breakdowns. Lastly, Info Grove is equipped with geo-fence and beacon technology. The City of Lethbridge will be able to leverage this to create spatial-based triggers to notify users when entering a park or recreation facility, if relevant. Cities across North America are developing mobile apps as a new way of reaching citizens in a mobile-first environment. In 2017, the average user spent over two hours a day on mobile apps, and over three hours a day for millennials. 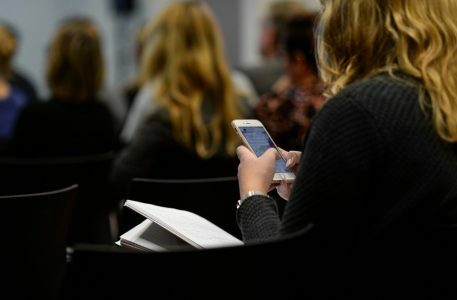 Mobile apps present a new avenue to reach citizens, gather insight and opinions, and connect them to local services and events. We often see cities tackling mobile communication with a single-focus app, such as a 311 report or garbage schedule app. While we do see immense value in these types of apps, we believe that a complete city app, with a wide-range of services, provides the most value to citizens. For example, the City of Hamilton uses our Info Grove platform to send emergency notifications, promote events, link citizens to jobs and other services. Allow citizens to complete reports in the mobile app to notify city staff regarding important issues. 311 reports provide citizens with the tools to report any problems to the city, such as potholes, graffiti, or property damage. Ideally, you’re able to configure each report so it’s emailed to the appropriate staff member. Keep citizens up to date with push notifications for city emergencies. 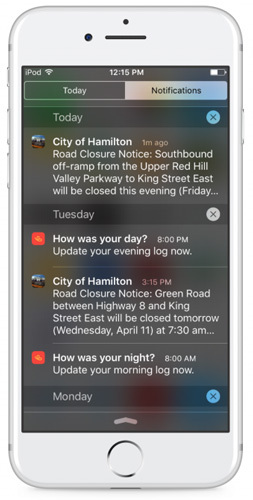 The City of Hamilton uses push notifications to inform citizens about road closures, weather warnings, and changes in hours of operation for public facilities. Allow citizens to personalize their experience with the mobile app with startup questions. Not every push notification needs to be sent to every app user. Startup questions give the power to the citizen to determine how often they want to be notified. Integrate geo-fence technology to alert citizens who enter a specific location with push notifications or location-specific content. 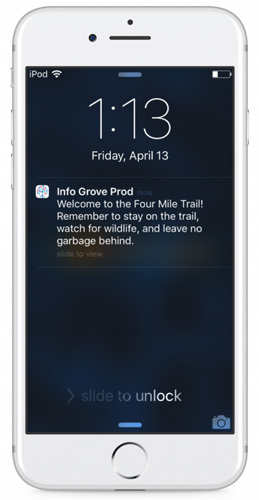 For example, when an app user reaches the trailhead for a hike, he or she would automatically be sent a push notification with trail details and any relevant information. Connect citizens to public parks, recreation facilities, hiking trails, shopping malls, bike routes, and other points of interest. The City of Surrey links users to its large system of bike routes for easy access. Keep citizens informed with everything happening in the city. Allow citizens to add events to their native calendars, share on social media, and get directions. Create new content to promote new festivals and conferences in the city. A good mobile app has features that keep users coming back for more. Every citizen is interested in weather, right? 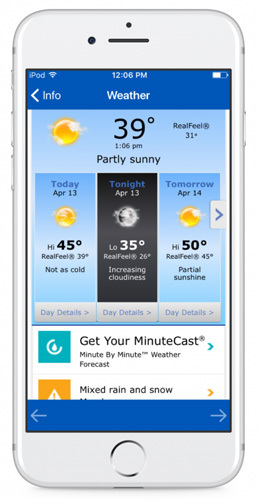 Including an active weather widget in the app encourages citizens to launch the app on an ongoing basis and will link them to other app features. Two-way communication is vital. Provide citizens with a city contact list organized by citizen need or department. Allow citizens to email, phone, or schedule a meeting with staff representatives. Gaining organic engagement on social media is difficult. Are citizens even viewing your Tweets? Integrate your social media accounts in the app and connect users to your Facebook, Instagram, Twitter, or Youtube account. The most important feature to include in a city app is updated content. Whatever features you decide to implement, whether a 311 report, garbage schedule, or local events, if your content is outdated or irrelevant you will not gain a consistent user base. Unfortunately, many cities fall behind in this category and we are left with archaic city apps in the app stores. 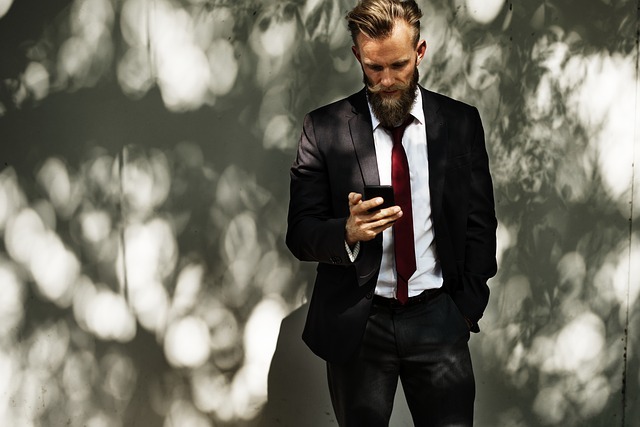 To combat this challenge, a mobile app should find ways to integrate to current communications, such as a website hosted with WordPress or Drupal. However, you’ll likely have content that does require ongoing maintenance. If you’re choosing to outsource your development to save costs and gain expertise, look for an app service that provides a backend content management system so non-technical staff can log in and update content — no coding required. Also, don’t forget to set up Google Firebase Analytics to track your success! Interested in building a mobile app for your city? Click here to see if Info Grove is right for you! The City of Pittsburgh is taking a mobile-first approach to government accountability and transparency. Pittsburgh residents and employees who suspect the fraud, theft or waste of city dollars can now report it through a mobile app. “We have employees in every neighborhood in the city. We have citizens who are watching them. This gives an opportunity for citizens to immediately report any of that kind of activity that they believe to be waste or misuse,” said City Controller, Michael Lamb. Learn more about the Office of the Controller and its role as the independent watchdog of the city’s resources. Report fraud, waste, and abuse against the City of Pittsburgh. Search city contracts, campaign donations and expenditures of candidates for City offices, and lobbyist that do business with the City. Use Fiscal Focus Pittsburgh to create and analyze custom reports on the City’s financial data. Search Unclaimed Property to see if the City owes citizens or businesses money. Read Pittsburgh’s Comprehensive Annual Financial Report, the detailed explanation of the City’s revenues and expenditures, or the abbreviated version, Popular Annual Financial Report. Find City Financial and Performance Audits to see how Pittsburgh has ensured your tax dollars are working for citizens. Connect with Pittsburgh through social media to get all the latest news from the City office and about City finances. Give Pittsburgh feedback on how to better to protect Pittsburgh’s finances. The mobile app collects and stores all forms and information from the app in a backend content management system. All reports are submitted anonymously to ensure citizen safety and confidentiality. The City of Pittsburgh mobile app was built and maintained using 14 Oranges’ Info Grove software. Governments across North America are using Info Grove to reach citizens using a mobile-first approach. Info Grove allows multiple levels of government staff to access the backend to add and edit content in real-time. To learn how Info Grove can help your city, visit our government page today. 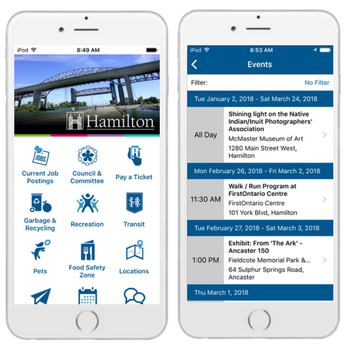 The City of Hamilton has launched “CityApp”, a new way for citizens to find news and information in a mobile-first environment. CityApp was built to provide the most used tools from the City of Hamilton website into a mobile app. After scanning website analytics, City staff identified several primary use cases that became primary integrations in the app. Converting these features into a mobile app environment helps decrease obstacles that citizens face when completing tasks. Download the app for iPhone and Android today! Access waste collection resources, including our interactive waste collection calendar and sorting tools. View and filter drop-in recreation schedules by date or location. Add classes to your calendar and get notifications when drop-in programs are cancelled or facilities have emergency closures. 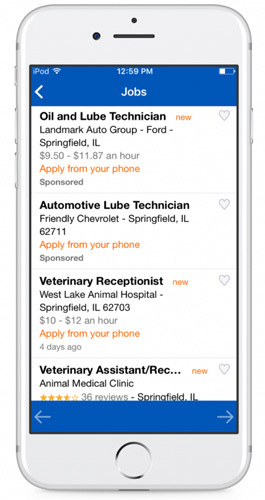 Browse job opportunities in the City. ‘Near Me’ GPS functionality – find local events and festival listings based upon distance from your current location. Read recent media releases from the City. 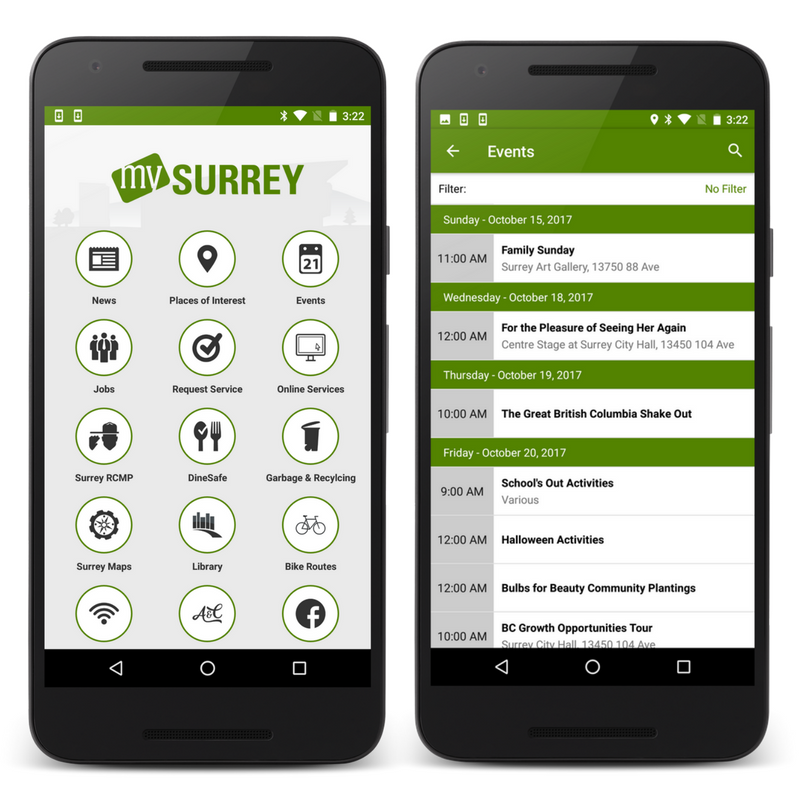 Find and contact Councillors, easily add committee meetings to your smartphone calendar, check meeting agendas and watch videos of Council sessions. 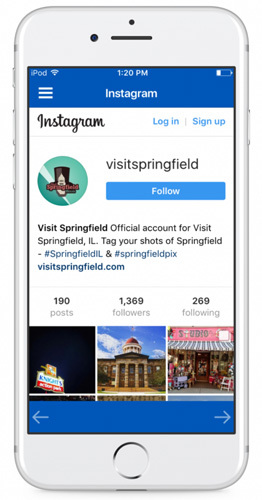 Check out City of Hamilton’s official Instagram, Twitter and YouTube channels. Pay and view parking tickets. Access public transit routes and schedules. Buy or renew your dog license, and find a dog park. Access information regarding Food Safety and inspection results of restaurants in the City. View city locations, including parking lots, flu shot clinics, fire stations, hospitals, swimming pools, and more. Write a feedback survey to provide input about the mobile app, feature set, and what to improve. When users first download CityApp, they are prompted to answer a series of start-up questions to personalize their experience with the app. Users are asked questions such as what area of Hamilton they live in and specific services or topics of interest. 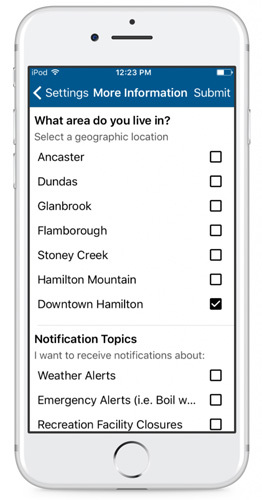 This allows the City of Hamilton to send out notifications for emergencies, road closures, program cancellations, and service changes citywide or surrounding areas only. The City of Hamilton plans to update the app on an ongoing basis and provide new links and resources for citizens. The CityApp is built and maintained using 14 Oranges’ Info Grove platform, allowing city staff to easily update and edit content in the app. Info Grove is built with a unique framework that allows City staff without a technical background to make changes in the app. At any time, citizens are able to update their preferences to receive more or less push notifications. Citizens are also encouraged to give their opinions about the app and how it can be improved. While growing its digital capacity, City of Hamilton staff were trained on how to use the content management system tied to Info Grove. City of Hamilton staff have access to the backend where they can add and edit content, send push notifications, collect forms and data, and create banner ads for emergencies. The system is easy to learn and is able to sync with 3rd party tools, such as WordPress and Drupal. To learn more about the app platform that the City of Hamilton is using to reach its citizens, visit our Info Grove page today! A few weeks ago, we released an article about Union County and Monmouth County and their push to increase political engagement. Both counties use our Info Grove service to manage their apps and communicate with local citizens. The mobile apps are used before, during, and after the election process. 14 Oranges partnered with New Jersey counties to change the way people learn about local elections. The county elections have been over for a few weeks now and here is what we learned. The New Jersey counties used their apps to keep citizens up to date throughout election day. Push notifications were sent to inform citizens of polling station hours, and they sent updates as votes were counted. Citizens continued with their day as they received election notifications, keeping them engaged. With the political mobile app, citizens don’t have to refresh a web browser or a social media page to stay up to date; they just use the app. A common reason why people don’t vote is that they don’t know who’s running and who’s running for what. A mobile app, operated by a nonpartisan body, gives a centralized platform for those running in political campaigns. Each candidate can have a section in the app, controlled by the unbiased officials so that citizens can read an objective overview of candidate bios, promises, and beliefs. 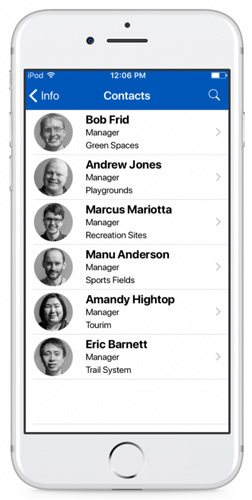 In addition to candidate ID cards, the mobile app is used to provide the basics, and we mean the basics. The apps answer the obvious questions, such as “Am I registered?” or “Where do I vote?” The political mobile apps make the voting process as easy as possible. Governments need to find ways to take down the barriers of the past, and a mobile app is a solution for the 21st century. Listen here to learn about the political apps in New Jersey, and how it changes election day engagement with active push notifications. Will this trend push to British Columbia? Are you looking to create a mobile app for your county, region, province, state, or city? Contact us today to see how 14 Oranges can help you meet your political objectives. 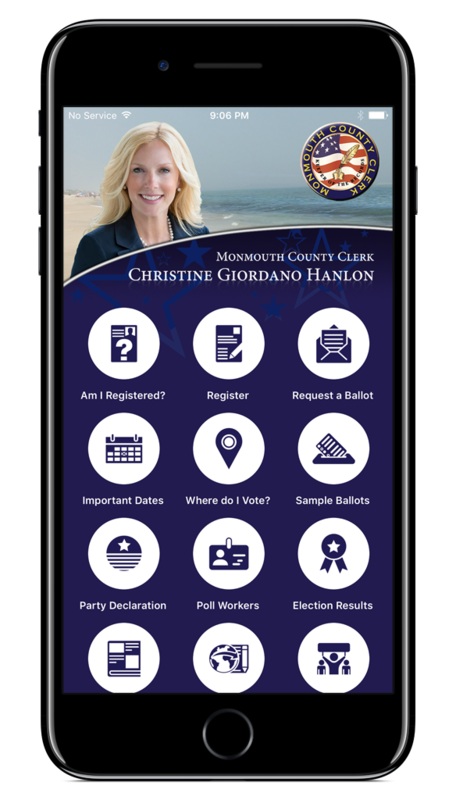 Union County and Monmouth County are now using 14 Oranges’ Info Grove self-managed mobile app service to engage citizens politically. 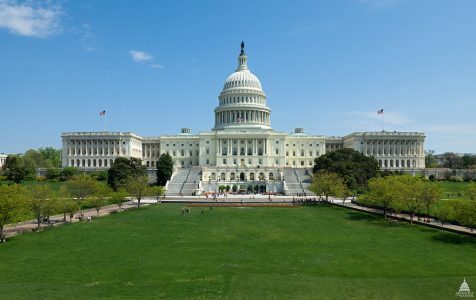 Both counties have recognized the need to provide political content on the digital screen of the public’s choice in order to increase engagement. As government communication is becoming increasingly mobile, Union County and Monmouth County have adapted quickly to this transition. 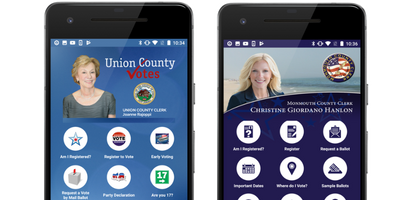 Both counties are using the app to provide election-related information to help citizens in a variety of ways. Most important is that they are helping citizens determine whether they are registered and where to vote, view district maps, and review candidates. 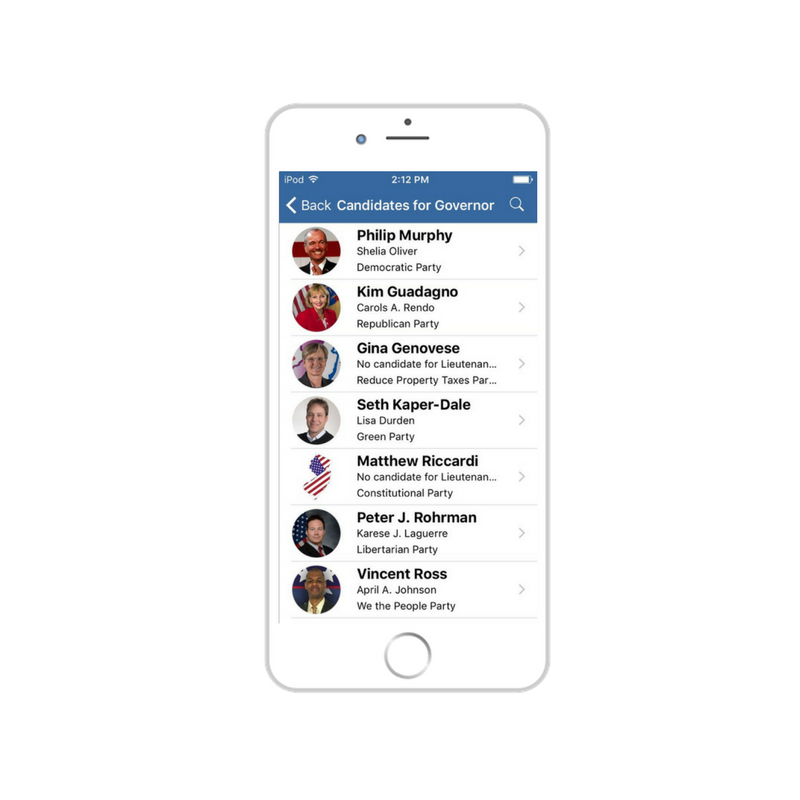 The app acts as an all-in-one stop for political events, dates, and information. Union County and Monmouth County will be able to continuously update and add content using Info Grove’s backend content management system. This allows non-technical staff to edit their app and fill it with new content every election year to keep the app up to date. Voters can view candidate promises and objectives, review past elections, and access PDF resources. This means that citizens will have improved access to information to help them make informed decisions. Both counties even go as far as to assist military and overseas Americans who aren’t physically present to cast their ballot. 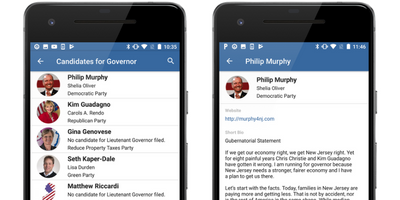 Interested in learning how a mobile app can help your political objectives? Contact us today for a free online demonstration! 14 Oranges CEO Sylvain Marcotte spoke on Evolution Radio about the value of mobile apps for governments. 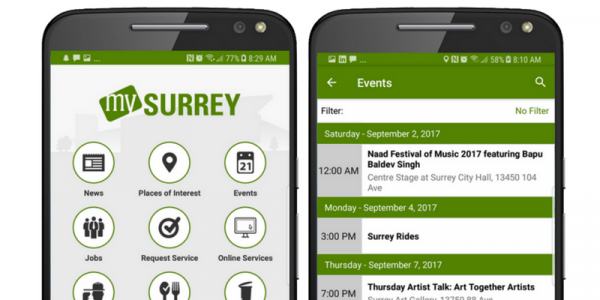 14 Oranges has deployed apps for governments serving a variety of functions, from citizen engagement apps for the City of Surrey, to mobile workforce management apps for the City of Richmond. Listen to the latest edition of plugged in podcast below. Interested in mobile app statistics from 2017? Check out our infographic here.